We here at monster HQ are really excited to present our newest monster...BUB! Bub, was designed by our friend 84Pages (aka Page Sanderson). There will be 20 monsters made each will be signed and numbered by Page. You can currently pre-order your Bub by clicking here. You can pick up your pre-ordered Bub at the opening for Page's upcoming show at Luscious Nectar in Fort Collins, June 7th, from 6-9pm. If you cannot make it to the opening not to worry we will start shipping orders the week of June 10th. If you have any questions about pre-orders, shoot us an email and we will get back to you as soon as we can. Posted on May 31, 2013 by Ray Tollison and filed under Monsters, New Products, DUO and tagged monsters DUO Page Sanderson 84Pages Bub. OK, Well maybe not a complete take over, but Monsters will be visiting Seattle! We are really excited to announce that we have been included in the Plush You show that is held each year at Schmancy Toys in Seattle. 1932 2nd Ave, Seattle to be exact. The show opens in October 11th and the opening runs from 5-9:00pm. Yep you read that right OCTOBER, so that gives you plenty of time to plan your trip! Until October and for more information make sure to visit the Schmancy Toys website! 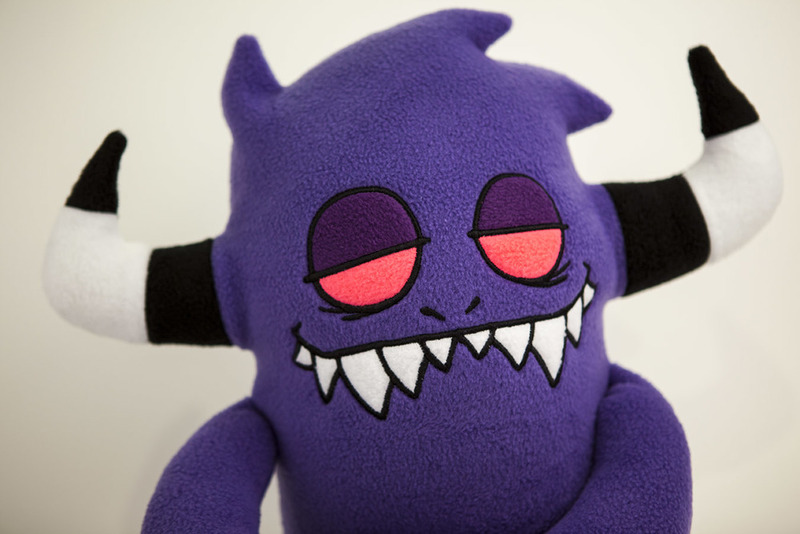 Posted on April 10, 2013 by Ray Tollison and filed under HQ News, markets and tagged Monster Markets Schmancy Toys Seattle Plush You. We have a new series of monsters "The Stripes" so for all you paper monster likers we have made a stripes paper version. So we will not keep you with a lengthy blog post we will just show you a photo and give you this AWESOME LINK to download the PDF file. Start cuttin', glueing and sharing! Make sure you make two and share it with all your friends you love and maybe make a new one by giving one to someone you don't know!! Posted on April 5, 2013 by Ray Tollison and filed under paper monsters and tagged paper toys paper monster Monster. AHHH...we cannot believe it is already March?? Where did February go? It seems to have ended a couple days early. As short as it was it has been a great month here at Monster HQ. We opened on new online shop, learned to make tutus (who knew monsters liked tutus?) and MOST IMPORTANT we were able to spread a little bit-o-awesome to Realities for Children and to our friend Caroline who was in the hospital. We also started planning our big Monster Makers event that will be in May, it is going to be great but we will post more about that very soon, so stay tuned and know that we could not do any of this without y'all awesome monster likers! THANKS FOR ALL YOUR SUPPORT and here is to an incredible March! OH YEAH! We also created a big huge 10lbs blob called booger and that got a little out of hand! Caroline with her new monster friend! Posted on March 1, 2013 by Ray Tollison and filed under HQ News, Monster Drop, monster update and tagged February Monsters A Monster to Love Realities for CHildren CHildrens Hospital Monster Drop Monster Makers. OK so it is a couple days early, but we wanted to share our newest paper monster with you now so you have plenty of time to print, cut, fold and share her with all those awesome folks you love. Enjoy and eat lots of those chalky heart things on Thursday! Click here to download and get started. Posted on February 12, 2013 by Ray Tollison and filed under Monsters, paper monsters and tagged Monsters paper monster paper toys valentines.